The number of incoming personnel connected to the Army Cyber Command’s relocation to Fort Gordon’s Cyber Center of Excellence and other growing missions will be even greater than the Army originally thought. The latest Army models estimate 4,700 soldiers, federal civilians and contractors will move to Fort Gordon by the end of fiscal year 2019, said J.C. Mathews, the installation’s public affairs officer. Original projections were between 3,700 and 4,000 new personnel. The updated figures were not connected to the Department of Defense’s announcement last week that nearly all of the nation’s installations will lose troops as the Army draws down its force from 490,000 to 450,000 in two years. Georgia’s Fort Benning and Fort Stewart will lose 3,400 and 950 soldiers, respectively. Army restructuring numbers showed Fort Gordon adding 41 troops by the end of 2017. Mathews said that accounts for changes to units previously assigned to Fort Gordon through 2017 and does not account for the growth associated with Army Cyber Command. 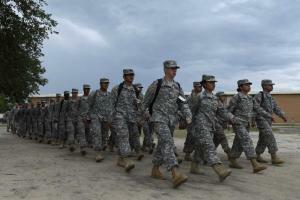 Fort Gordon has already experienced an influx of new personnel. About 1,700 people arrived between 2012 and 2014, and 600 more are expected in 2015, according to data provided by Mathews. The growth will peak in fiscal year 2016 when 1,140 are expected. Then, the buildup will taper between 2017 and 2019 to add the remaining 1,300 personnel. The Army estimates about 7,240 family members including 2,344 school-aged children will relocate with the incoming personnel, Mathews said. Some of those spouses and kids have already moved into the Augusta area with the approximately 2,000 personnel who have arrived. Growth through fiscal year 2019 is mostly connecting to buildup of the Cyber Protection Brigade, 116th Military Intelligence Brigade and units that support the National Security Agency and arrival of Army Cyber Command headquarters in 2017. The headquarters is currently located at Forts Belvoir and Meade in the Washington, D.C., area. Maj. Gen. Stephen Fogarty, commander of Fort Gordon, said in a statement last week that the Army’s decision not to cut troops affirms changes at the installation that include more missions critical to national security.